During the 45th anniversary celebration of the Malaysian Plastics Manufacturers Association (MPMA), held in Kuala Lumpur on 23 June, President Lim Kok Boon said that local makers can profit from exports as long as they can match high quality with low costs. MPMA also launched its anti-litter campaign and promoted its 3Rs policy. The prevailing Euro debt crisis and the sluggish economy of the US continue to affect the plastics manufacturing industry in Malaysia. During the dinner of MPMA, Lim remarked in his opening speech that last year�s performance of the industry appeared to be modest compared to 2010. The Malaysian plastics industry registered a total turnover of RM16.14 billion in 2011, representing a 2.1% increase compared to RM15.81 billion recorded in 2010. This was achieved on the back of a higher export value which has, however, partially eroded by the weaker domestic market. In particular, the domestic electrical and electronics industry, which is an important sub-sector for the plastics industry, was largely flat while there was a mild decline in the automotive sector. However, exports continue to expand in view of the stronger demand for packaging films, particularly from Japan and the EU markets. Total exports of plastics finished products for 2011 increased by 6.2% to RM9.97 billion, accounting for 62% of the total plastic products manufactured. The exports of plastic products to Europe and the US will certainly continue despite the economic slowdown. Even at below-average growth, developed countries will continue to account for the majority of total plastics demand. Companies from these regions will be hard-pressed to search for low-cost alternatives. Meanwhile, Australia with its economy rising is also seen as a leading export destination for Malaysian plastic manufacturers. �The strategy is to focus on export markets. Twelve years ago, exports only accounted for 30% or less for most manufacturers but now most of our members are allocating 60% and above for exports, owing to the efforts by our members to promote the export business into the huge global market rather than depending on the smaller home market,� said Lim. To help achieve that goal, MPMA is putting emphasis on education. Lim said that transferring the talent and skills into practice remains the greatest contribution to the industry. As new technology underpins more and more manufacturing processes, it has become apparent in this development and expansion that individuals either already posses, or will be able to acquire readily the skills necessary to control and operate new technology. Keeping up with the influx of new processes and technologies, MPMA�s Talent Development Programme (TDP) upgrades the skills level of the Malaysian plastics industry as envisioned in the government�s Strategic Reform Initiatives (SRI). The programme�s central focus is to help manufacturers understand how innovation happens, the management of technological and organisational change, and the socio-economic consequences of innovation. �It�s like having two Ferrari race cars driven by different drivers; although the engine is exactly identical you�ll get different results. Hence, it is still the driver that makes a difference,� Lim simplified. TDP combines online and classroom training and currently covers the syllabi for intermediate and advanced certifications in injection moulding. By Q3 2012, TDP will be offering film extrusion and blow moulding certifications. 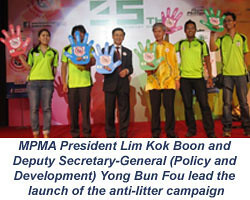 Taking a stand against litter, MPMA launched a holistic approach to environmental conservation � �Don�t be a Litterbug� campaign � during the anniversary dinner together with Lim and Yong Bun Fou, Deputy Secretary-General (Policy and Development), Ministry of Housing and Local Government, who was representing Datuk Seri Chor Chee Heung, Minister of Housing and Local Government. 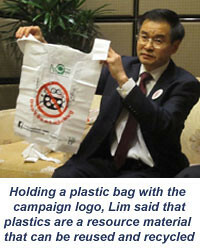 In his address, Lim encouraged guests to make the pledge towards keeping the environment clean emphasising that the industry�s active participation in the �Don�t be a Litterbug� Campaign, would promote to others to keep the environment clean, which is a socially responsible thing to do. �MPMA and the Malaysian Plastics Forum are launching the campaign to create the awareness for the public to stop indiscriminate littering, which is a principal cause of environment degradation,� he explained. The Minister in his address had remarked that the effort to reach out to school children by the MPMA-Scientex Foundation is commendable as children represent the generation that needs to get it right. He had added that by getting the message across to children, instigating habits, attitudes and values right from the start, and then only will people be able to create a future for the environment, and for them. The Minister had also informed the audience that the Department of National Solid Waste Management and PEMANDU (The Performance Management & Delivery unit under the Prime Minister's Department whose main role is to oversee implementation of the Economic Transformation Programme) had organised a three-week laboratory study in detail on solid waste management in the country. The laboratory found out that the dependence on landfills will increase CO2 emission by 50% in Peninsular Malaysia by 2020. In this respect, the minister added. �It is targeted that in 2020 we would have to reduce the landfilling of solid waste by 40%, which will in turn reduce the generation of greenhouse gases from landfills by 38%.� He went on to say that the 3R plays an important role in waste management by promoting reduction of consumption, reusing products as a way to reduce consumption and recycling, so that products that can be recycled are given opportunities to be developed into new products without having to tap on existing resources. In this manner, the 3Rs helps to reduce waste, thus helping to sustain the environment. The lab study had recognised that the 3Rs industry value was estimated at RM476 million in 2005 and more than RM600 million in 2011. The industry has already an established informal recycling network that covers every part of the solid waste management value chain from storage to disposal. Apart from the annual MPMA-Scientex 3Rs Awareness Programme organised earlier in the year, MPMA will be reaching out to non-governmental organisations and town councils for potential partners in furthering the anti-litter cause.